Geraldine Hill is the founder of On Your Feet Inc. - Family Resource Center and currently rents 10 large units at Jamacha Point Self Storage (JPSS). Geraldine chooses to store with JPSS because it is more cost effective than renting a warehouse. Over the years, the JPSS team has seen Geraldine and her volunteers give back to our community and to our country. Day to day, hot or cold, rain or shine, Geraldine and her staff spend numerous hours going through and preparing all of their donated items to give back to the community through the local events they have throughout the year. With headquarters in Spring Valley, the mission of On Your Feet Inc. is “to provide assistance worldwide to low income families and individuals in order to improve their living conditions” On Your Feet Inc. helps families and individuals throughout Southern California and also assists in disaster relief across the country and abroad. Recently, Facility Manager, Rayleine Nungaray had the opportunity to speak with Geraldine about her recent visit to Redding CA, where Geraldine met many people who were affected by the wildfires. Geraldine heard many devastating stories, but was pleased to be able to pass out $100 gift cards to the families affected. It is refreshing to see that the community is home to such amazing people. 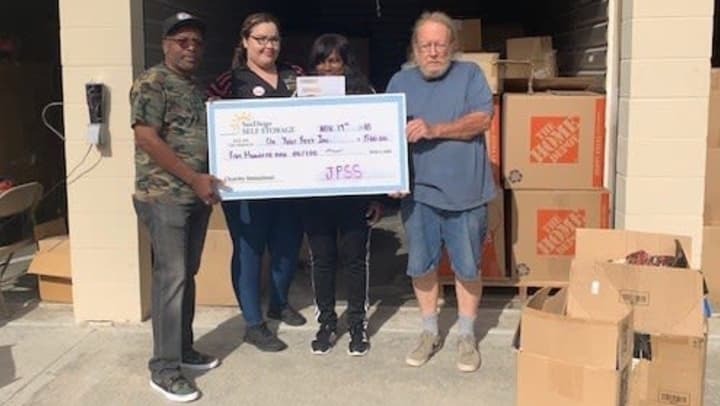 For this reason and more, the Jamacha Point Self Storage team wanted to feature Geraldine Hill and On Your Feet, Inc. - Family Resource Center as a loyal tenant, and also as the benefactor of JPSS’s 2018 charitable contribution.